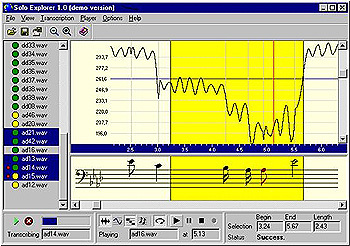 Solo Explorer is a wav to midi conversion, automatic music transcription (recognition), and music notation software for Windows. It achieves high accuracy in extracting sequences of notes out of the audio records of solo performances. Solo Explorer is designed as a complete music recognition environment. It offers the functionality you need to take a music recognition project from concept to completion in one package. You can open audio files or directly record your own solo performances. Once your audio is ready, you can launch Solo Explorer's wav to midi conversion engine to convert your audio to midi. Solo Explorer returns you a music score in a standard notation that can be played, edited, and saved. Though Solo Explorer has many features, it has straight-forward and easy-to-use interface. 1. Solo Explorer converts wav files to MIDI. a. It captures pitch, loudness, and performance effects (vibrato, portamento, glissando) of your solo recordings as faithfully as possible (music analysis, music composition). b. It extracts music score out of your solo performances with the highest accuracy available with today's technology (music composition, ethnomusicology research, music transcription and typesetting, interface for content-based music retrieval). 2. Solo Explorer can show if your voice or instrument is in tune (music training, instrument tuning). 3. Solo Explorer is a robust and accurate pitch extraction tool (music and speech analysis, speech synthesis, intonation research). 4. Solo Explorer lets you play and experiment with music. 5. Solo Explorer cannot handle polyphonic performances (except for unison performances), i.e. audio that is a mixture of sounds coming from multiple sound sources. Automatic. Solo Explorer's wav to midi conversion engine is entirely automatic. You do not need to make any changes in conversion settings for two different pieces of music as Solo Explorer does this for you. Thus, you can transcribe hundreds of audio files by a single mouse click. Voice friendly. Solo Explorer offers you unmatched accuracy in recognizing voice singing arbitrary lyrics. Though singing is the most natural way to enter the sound into a computer, the majority of existing wave to midi converters still have major problems with singing voice. Accurate. Solo Explorer incorporates state-of-the art wav to midi conversion engine based on advanced digital signal processing and artificial intelligence techniques. We are the only ones that use quantitative measures and constantly monitor the recognition accuracy of our conversion engine. Solo Explorer makes one step beyond the usual transcription of music. Instead of simply registering the sounds that were actually performed it attempts to guess the intentions of the performer. This approach helps in transcribing highly mistuned performances. Precise. The time resolution achieved by Solo Explorer is as high as 10 ms. Humans perceive notes only if their duration exceeds 40-50 ms. Frequency resolution achieved by Solo Explorer has no theoretical limits and is largely better than 2-5 cents that is the reported sensitivity of human ear. Robust. Solo Explorer was tested in hostile recording environments. It appeared to be robust with respect to low-quality microphones, background noise and reverberation. Fast. Though Solo Explorer is not a real-time wave to midi converter, it achieves average recognition speeds better than 20% of the realtime audio speed (Pentium II 300 MHz).